25 things. | everything will turn out alright. here are 25 you may not know about me. 1. my favorite colors are blue and mustard yellow. 2. our dog, auggie, is half chihuahua and half italian greyhound. we considered naming him umberto burrito to cater to both of his nationalities. 3. travis and i were born 2 days apart, on september 21 and 23, 1985. 4. we both weighed 7 pounds 15.5 ounces at birth. 5. my favorite television shows are the office (american), 30 rock, it’s always sunny in philadelphia, glee, top gear, iron chef, top chef, and no reservations with anthony bourdain. 6. my least favorite shows are anything starring giada de laurentis, rachel ray, and oprah. 7. i’m slightly obsessed with cryptozoology and even did my senior thesis in college on bigfoot. 8. i went to art school (the maryland institute college of art in baltimore) and have a BFA in sculpture. 9. i almost transfered out my sophomore year to study anthropology. 10. i don’t do sculpture anymore (never really did). instead, i focus on illustration. you can find some of my more recent work here. 11. travis does most of the housework (bless him), except for cleaning the bathroom and some of the laundry. 12. my dream jobs are food critic and docent at the british museum. 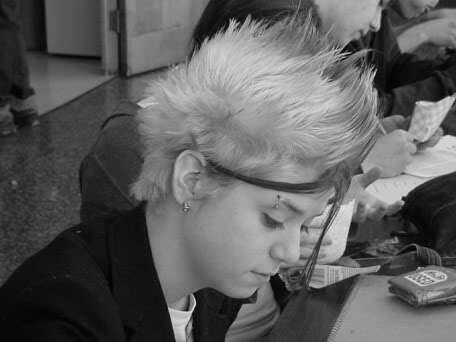 13. i sang in a punk rock band in high school. our name was e.t.c. 15. my favorite authors are kurt vonnegut, jr. and italo calvino, and i have read almost every book they’ve written. 16. i hate discussing politics. 17. i love all dogs, but have yet to meet a cat i like. 18. i have had the same favorite band, ben folds five, since i was 9 years old. that’s 15 years of true, unwavering love right there. 19. i have 7 different kinds of salt in my cupboard right now: hawaiian pink, hawaiian black, fleur de sel, truffled, kosher, pacific flake sea, and iodized table salt. 20. i will eat almost anything once. some of my “strangest” meals have included pig ear, honeycomb tripe (cow stomach), and bone marrow on toast. 21. my favorite movies are the royal tenenbaums and the room. 22. a portion of my left eyebrow sticks straight up. nothing makes it smooth down. i love it. 23. i am irrationally afraid of spiders, but most insects (except for the really large/gnarly ones) don’t bother me. 24. i really love beer. i went through the book 1,001 beers you must taste before you die and tallied how many i’ve had. the final count was 111. 25. i have a hard time making new friends. that is the one thing about myself i’d most like to change. there you have it! 25 things you probably didn’t know (and had no desire to) about me. happy friday! p.s. if you enjoy hanging out in this corner of the internet, vote for us! This entry was posted in Uncategorized and tagged stuff. Bookmark the permalink. Wow…it must be nice to have the time to actually post stuff like this! Enjoy it while you can; life as you know it is about to drastically change (for the better, of course!). Take care of yourself and my niece and give Travis a hug from Sophie. I was home all day with a killer stomach virus. I had nothing but time (in between trips to the bathroom) yesterday! Which one didn’t you know? Half of number 4 and number 11. Half of #4 and #11. I saw you on topbabyblogs and don’t know you but I find it hard to believe you have a hard time making friends – you seem so adventurous and interesting. I’m sure it’s not you and it’s them. also, love your blog! i’m sure i’ll be back to read more of your posts. Awww…my poor baby! I hope you feel better soon! I’m feeling a lot better tonight. Finally! Back to the grind tomorrow. I am so glad I know quite of few of those! Reading these made me miss you even more! I miss you too, Em. I really think Sylvie would benefit from the fresh mountain air in Vermont, don’t you? OOH! email me your new address! i need to send you and kevin an invite to the baby shower (it’s coed). yes I think the whole family would benefit from the fresh Vermont air!!!!!!! I’ll send an email right now!